I'm in the process of changing my name. It's not a particularly fun process -- there's a lot of standing in line and waiting involved, and I carry around my marriage certificate wherever I go, just in case. I've got my new driver's license and new credit cards, so that I'm signing checks and receipts with one name while still receiving bills in another. My personal e-mail still includes my maiden name, while my work e-mail has my new name. I'm getting used to answering to this, but I sometimes slip and still call myself that. The name change isn't the only thing I'm getting used to around here. There is also the change in seasons and transition from fall to winter, Halloween to The Holidays -- a transition that makes me impatient for the bustle of Thanksgiving and Christmas but dreading the cold months ahead. The sky is nearly pitch black when I leave the office, which has been the hardest part so far, since the cold weather has been slow to catch up. It's actually getting warmer, reaching the 70s this week so that I drove with the window down on my lunch break yesterday and left my jacket in the car this morning. 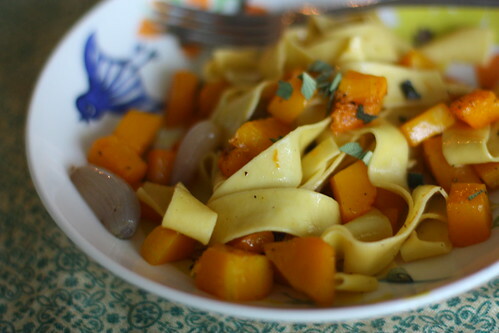 And there's this butternut squash pasta, an in-between dish of sorts, which seems so right for these days when it's dark by 4:30 but still nice enough to keep the windows open. It features butternut squash, which I've been eating on a weekly basis lately, and even Murdo asked me the other day if I'm getting sick of squash yet. The answer is no, I'm not, and I certainly hope I don't get sick of it soon because it's a winter squash, after all, and not even winter yet. 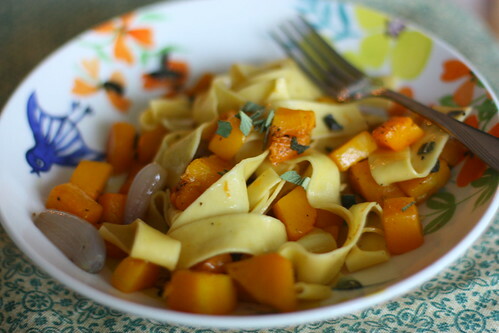 The squash is tossed with olive oil, salt, pepper, and brown sugar, and roasted with a bunch of halved shallots, then thrown over wide ribbon noodles. There is a sprinkling of sage that brings in a hint of the holidays, and yet the dish is so light you'd think it was simple meal prepared for summer or spring. But summer is long gone, and I hate to say it, but I kind of wish winter would just get here already. I know it's just around the corner and I'd rather get it over with, instead of remain stuck in this transitional period, wearing boots with no jacket, signing one name and answering to another. Until then, of course, I'm sure there will be lots more squash. Which I'm used to by now. I followed this recipe pretty closely, except ended up using 4 cups of squash instead of 3, and forgot about the cheese altogether. It was still tasty. 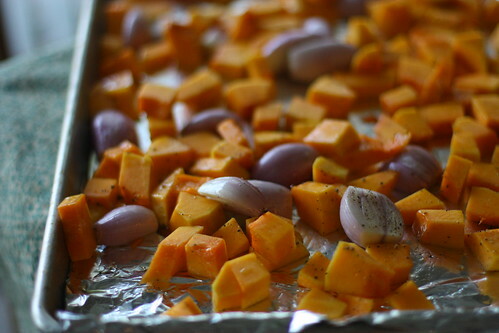 Combine the squash, sugar, 2 1/2 teaspoons oil, salt, pepper, and shallots in a jelly roll pan and toss well. Bake at 475 for 20 minutes or until tender, stirring occasionally. Stir in sage. Meanwhile, cook pasta according to package directions. Drain and place cooked pasta in a bowl. Add 2 teaspoons oil and toss well. Serve the squash mixture over pasta. Sprinkle with cheese. i'm not sick of butternut squash yet either, and i'm also wanting winter to show up already too. good luck with the name change, all that effort is so worth it, i'm sure! Lan - Thanks! I've been trying to find new ways to use butternut squash besides a creamy/smooth/pureed soup, which just doesn't appeal to me. How do you normally cook it? I'm definitely going to have to try this. My husband just discovered that he actually like butternut squash (I've loved it for ages). The name changing game is not a fun one. I've been married for a little over a year and I still carry my marriage certificate in my wallet because I haven't changed the name on one of my credit cards! That's really a "me being lazy" problem, though, haha. Stephanie - Thanks! Oh how I wish my husband liked butternut squash. I've got a real "me being lazy" problem,too, so I have a feeling I'll have a few credit cards and accounts with my maiden name floating around for years. Yes, the name switch is a long process. One of my credit cards took years to get the memo after sending numerous requests, ugh. You'll get through it all, though :)This pasta looks lovely and I love the addition of the shallots. Maddie - Oh, it's getting there. Earlier this week I had to scrape ice off my car windows. I am so not ready for the snow, but yes, thank goodness for comfort foods to warm up the belly! Jacqui, this looks delicious... I don't think I've had squash all fall - this is a shame, and I promise to get on it at once! Linnea - Yes! Squash is a must this time of year. I have one sitting on my kitchen counter right now, and now that it's getting cold out, I might add it to a comforting soup or stew. Have a great weekend! Yum. I love anything with butternut squash. I made this for dinner tonight. It is so perfectly tasty for a cold winter night. The second to best part, second to it's tastiness, is that it's super easy! I highly recommend this recipe. Thanks for sharing!